This week hasn't been a good week, my poor daughter has had a terrible sickness bug but fingers crossed she's on the mend now. So I've not had much time in the morning to do my makeup, but to be honest I haven't wanted to wear much either. So I've come up with 'Face of 5 in 5' minutes! Yes this only takes me 5 minutes. With the help of a couple makeup brushes. So if you're in a rush then why not give this a go, substitute the products I've used for whatever you have similar in your collection. remember the good old saying- less is more? In this instance I agree. I've used a few BB creams but for some reason I still love the Garnier BB Cream, I'm just getting through my second sample sachet and 100% intend on purchasing a full size. I've already checked and both Boots & Superdrug currently have it on sale for £7.49 so if you're a fan stock up! I've been using my Sigma F82 to apply and then use my fingers over the top to blend in certain areas. I've been reaching for my super strong under eye concealer which happens to be Benefit Boi-ing Industrial strength concealer. I use shade 02 which works perfectly with my blue-ish toned under eye area. I use the Boots No7 Concealer Brush to apply this and then gently soften the edges with my finger tips. I think special mention goes to the main product here- the Stila Convertible is fabulous! I've been using this on my cheeks and lips, I love the natural shade which gives a beautiful natural glow to the face. Plus a fab colour to wear on the lips also. I would love to invest and buy some more of these, if you have other shades I would love some recommendations. Then to finish off I applied a couple coats of i-Flutter and then VOILA. 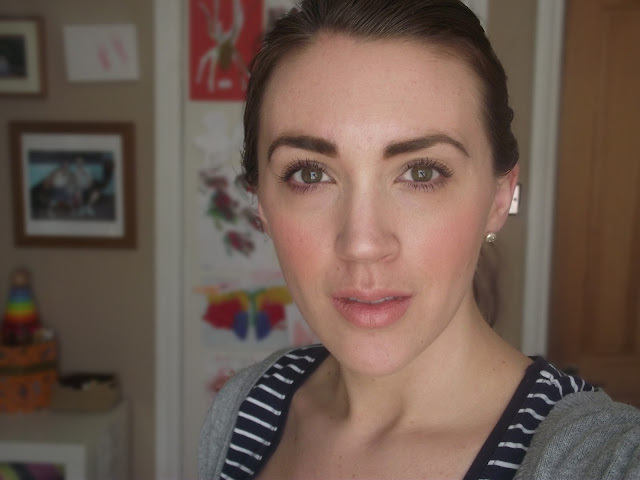 Such a quick simple look but very fresh and dewy, perfect for the spring! I hope you enjoyed this quick post, let me know if you would like to see more like this. I TAG anyone who would like to see if they can do 'Face of 5 in 5', you can pick up to 5 products and minimum of 3 brushes to create your look. Go on, it'll be challenge! Let me know if you do this I would love to see what products you use.